This has been an incredibly crazy couple of months. A new job, lots of travel, family visits, and a couple of huge events in town that I organized makes for a frazzled food blogger, thus the lack of posts in the past month. But I promise I’m back and ready to share more delicious recipes with y’all – starting with these Double Coconut Chocolate Cookies! The generous folks over at Fair Trade USA sent me a care package filled with Fair Trade goodies. Wondering what Fair Trade is? Buying Fair Trade ensures that you’re getting quality products and the people who grow, sew and craft them get a fair deal for their hard work. In fact, your everyday purchases can help farmers and factory workers in 70 countries work in safe conditions, earn extra money to invest in their communities and improve the lives of their families. For this recipe, I used the Nutiva Coconut Oil and the Lake Champlain Old World Drinking Chocolate Chips. The coconut oil is cold-pressed and never refined, deodorized or bleached! Savor its rich aroma and its smooth and sweet flavor. It’s ideal as a medium-heat cooking oil, a nutritious substitute in baking and even “better than butter” on bread, vegetables or popcorn. A pinch of salt will reduce the coconut flavor in savory recipes. And those drinking chocolate chips? Oh dear goodness, they are amazing! Good Housekeeping chose the Old World Drinking Chocolate as the winner of their Hot Chocolate Taste Test, so make sure to order some yourself. Don’t forget to support fair trade and purchase these products when you have a chance – you won’t be disappointed and you’ll be supporting a great cause. 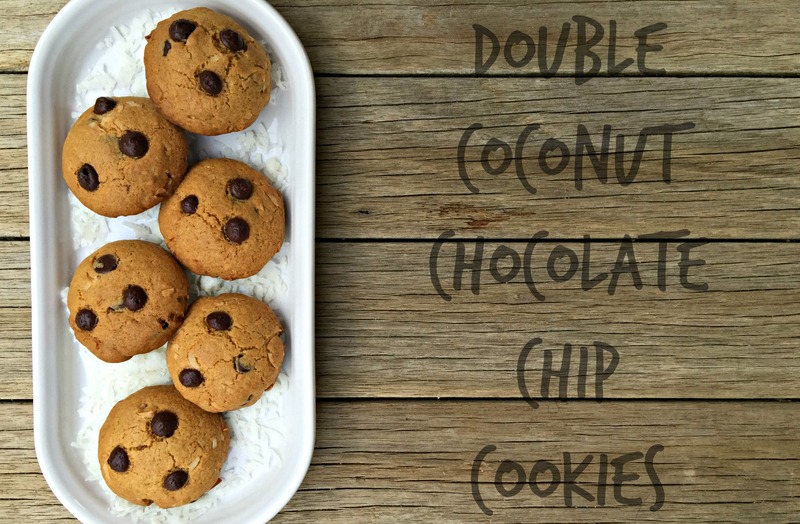 These are my favorite cookies to have as an afternoon snack - the double coconut is amazing and the chocolate just melts in your month! Cream the coconut and sugars together. Incorporate all the dry ingredients until mixed but do not over mix. Fold in by hand the chocolate chips, coconut, and milk. Scoop onto greased cookie sheet in one tablespoon-sized balls. Disclaimer: This post is sponsored by Fair Trade USA. yay Fair Trade! and yayyyy for these delectable cookies!